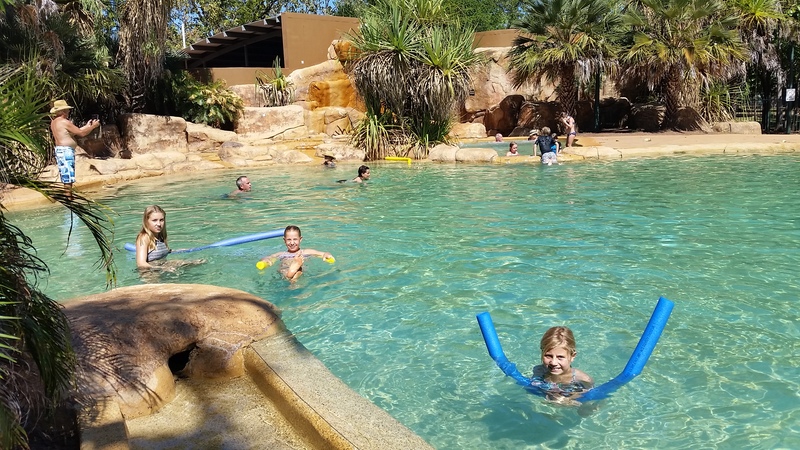 With the weather really starting to heat up and the swimming opportunities really starting to wind down, we decided to stay at the Cooinda Lodge (fancy name for caravan park, really!!) 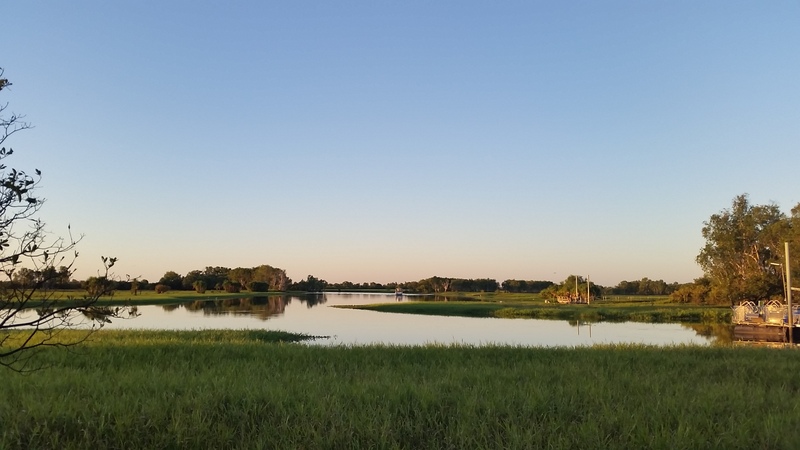 instead of one of the many national park campsites around the area, and for only an extra $8.00 per night for electricity, water, washing machines, bar and a pool, we found it more than worthwhile!!! 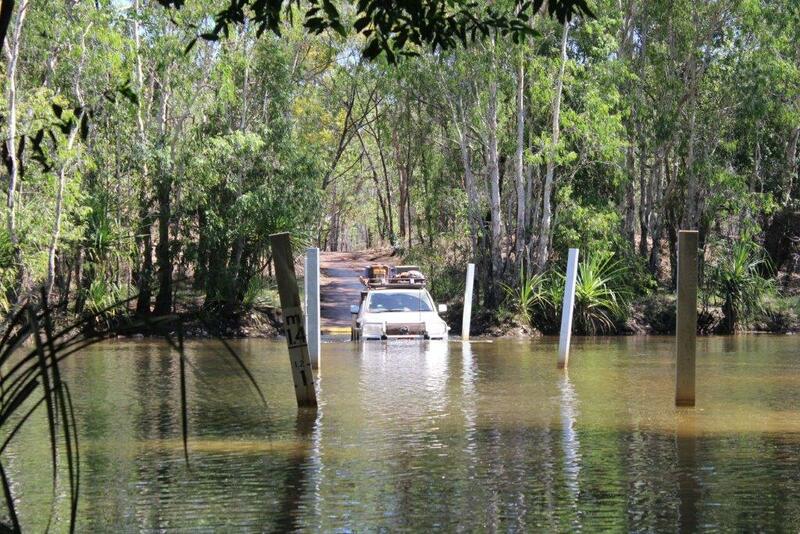 No croc test recquired here!!! 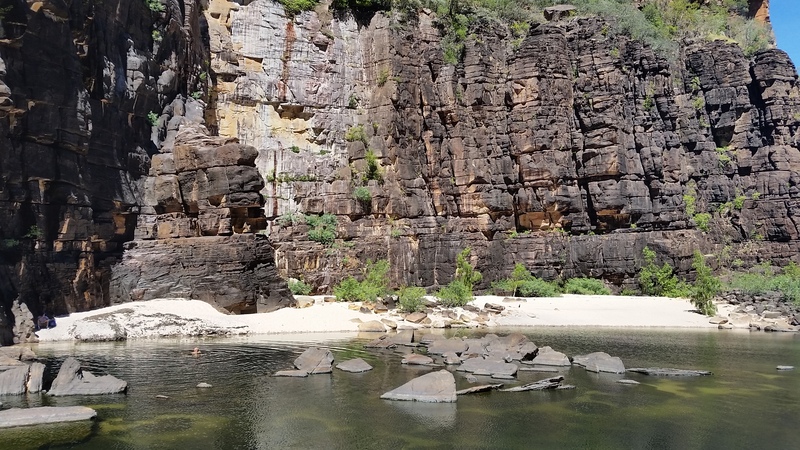 From our base at Cooinda, we decided to make the 50km dirt road drive down to the Jim Jim and Twin Falls region and boy what a disgraceful road it was too. 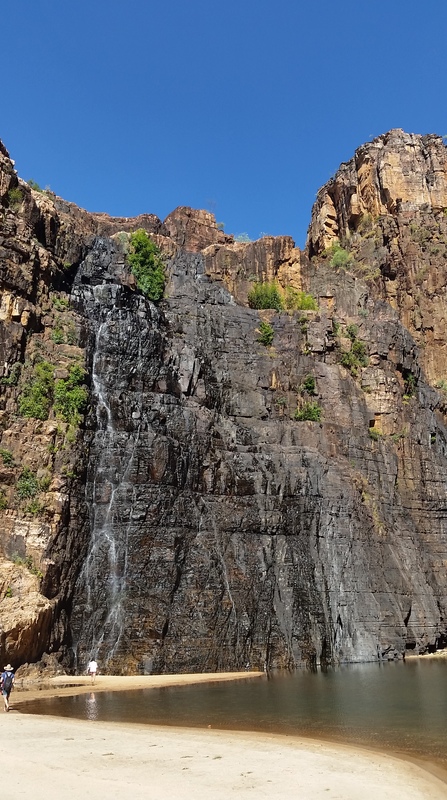 We decided the condition of the road, due its corrugations, was nearly as bad as the Kalumburu Rd off the Gibb, so after dropping the tyre pressures down to allow for a less rattling, bone jarring ride we finally made it to Jim Jim Falls, a long 90 minutes later. 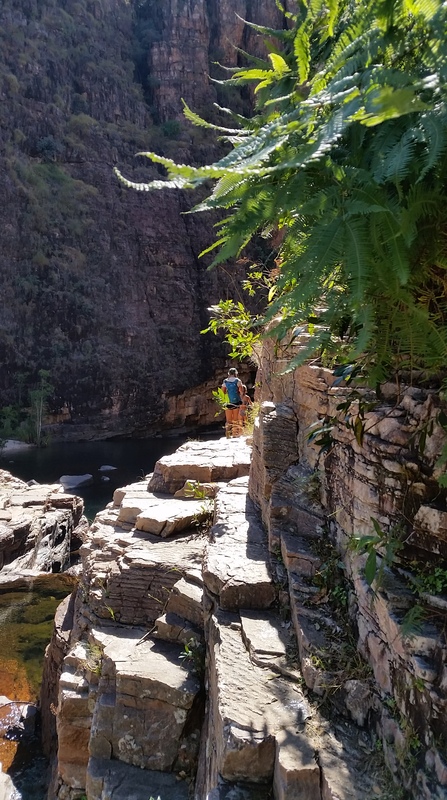 From the car park, the hike was a relatively short distance to the falls, however the rock hopping over huge boulders turned it into quite a strenous hike, thankfully, we were rewarded with a dip in the ‘beach pool’ area near the falls at the end. From here, we had the best views of the falls, that as people had told us, were not running. 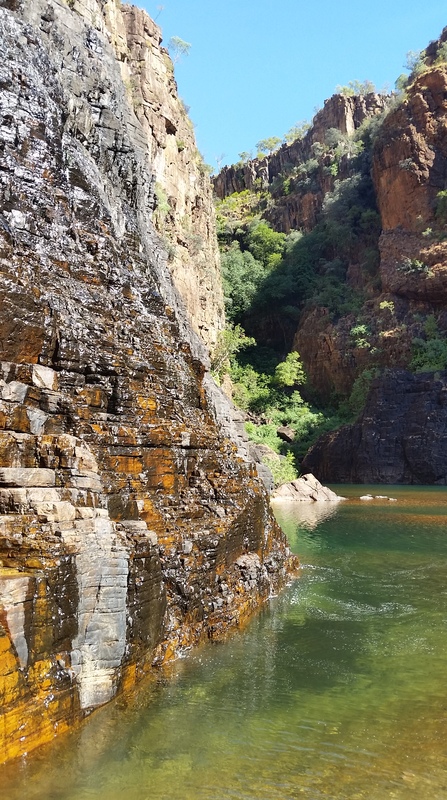 The lack of flowing water however, did not take away from the absolute awesomeness and sheer size of the escarpment around us and together with the palms and monsoon forest, it was a wonderful place to visit and peacefully sit and swim away from the crowds. If you sat still and quiet enough you could actually hear that the falls were in fact still running, yes the amount of water resembled the flow from a garden hose, however in my book it still counted!!!! Starting the walk into Jim Jim Falls. 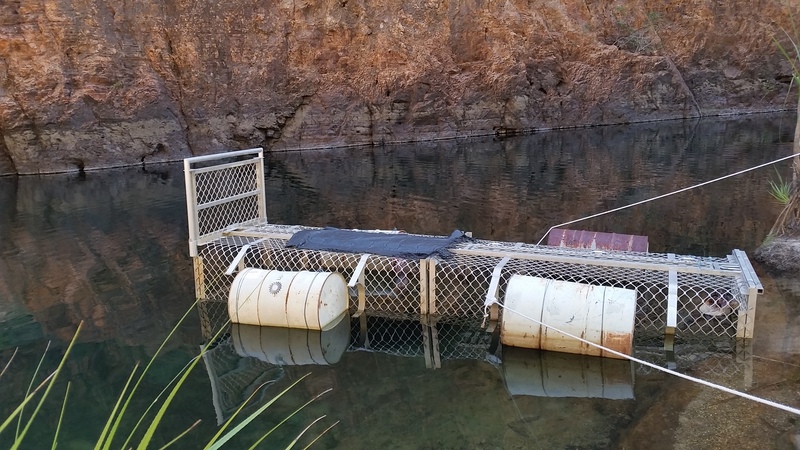 The croc trap on the way to Jim Jim. Beach swimming area at Jim Jim. Jim Jim Falls. 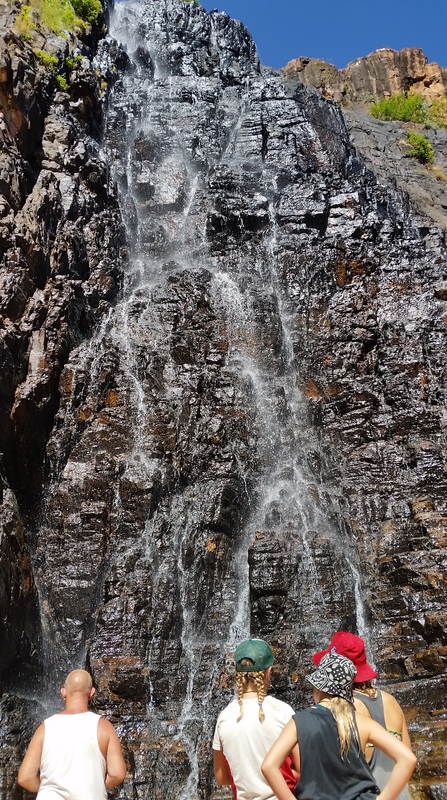 Obviously as the rocks are wet, there seems to be some sort of water falling……from somewhere…. 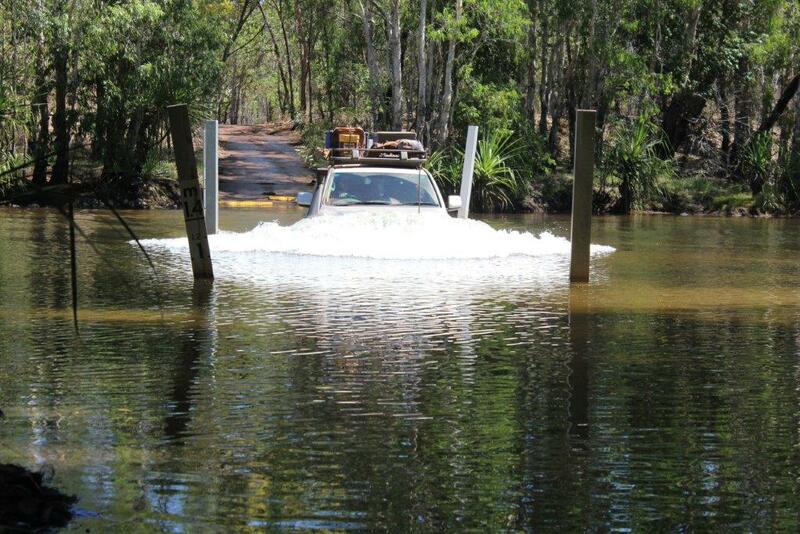 From Jim Jim we headed further south to Twin Falls, crossing the Jim Jim Creek, which was sitting at 0.8m, with many 2wd and 4wd cars not being able to go any further due to the need of high clearance and a snorkel. After sitting and having lunch and surveying the creek with another car of people, we hopped back into the car and headed through the crossing first, as per the other cars request…… With me staying back to take photos, Nik and the girls went through, then they came back again to pick me up, then we headed back through again to head toward Twin Falls!!! I have a feeling if I hadn’t put my foot down, Nik would have found another reason to go back through again. Heading into Jim Jim creek crossing on the way to Twin Falls. 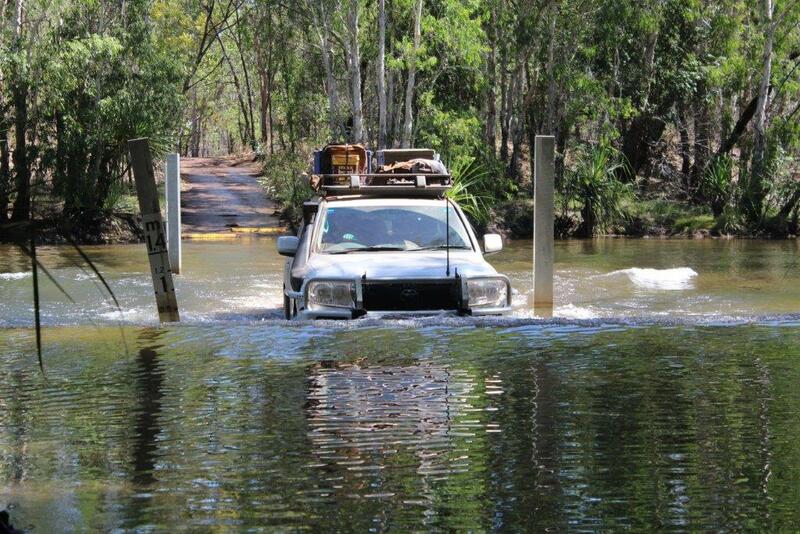 Safely through with no crocs hanging off our tyres!!! 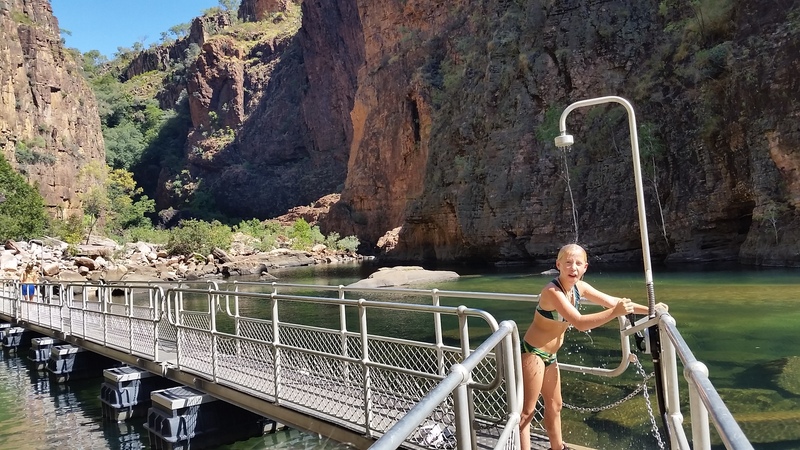 All aboard the Twin Falls boat shuttle. 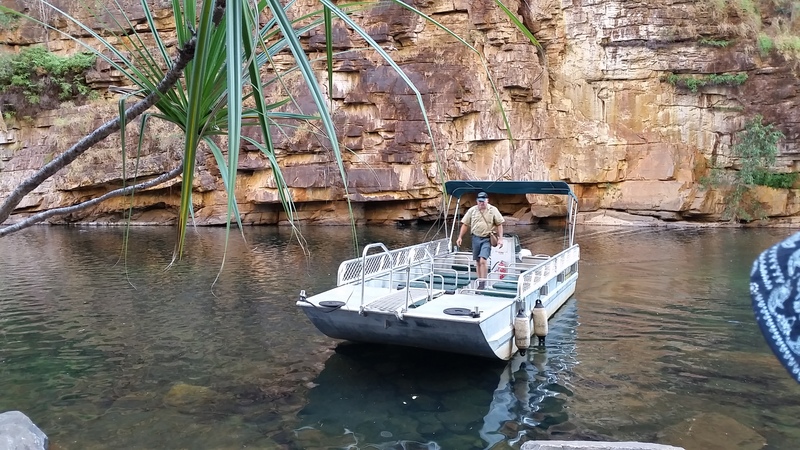 Boat trip to the falls. Cooling off shower along the walkway. Floating walkway, clearly no expense is spared for the tourists, these walkways getting helicoptered in and out each dry season…..
Croc trap with croc enticing pigs hind quarters. 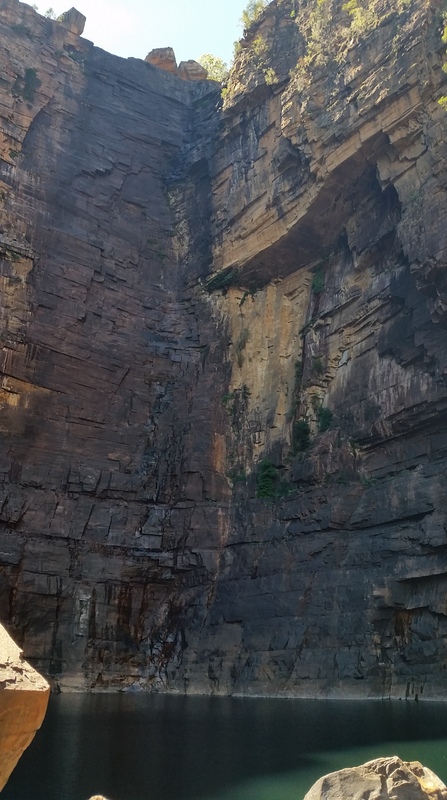 One side of the Twin Falls. Walking up and touching the flowing water, pretty special!!! Looking towards the second water cascade. The hike back to the boat. Only a stones throw from Cooinda was the Warradjan Aboriginal Cultural Centre, it is very well set up with a very informative interactive cultural display and gift shop. By the time we read our way through the display we ended up being there for over an hour, with Nik, myself and the older girls literally reading every plaque and display, totally absorbed in the stories and history. 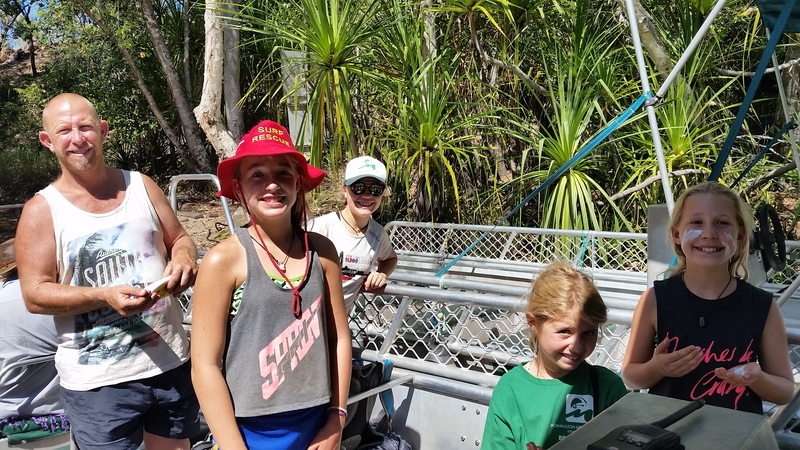 While Abs and Jess went straight for the animals display and continually kept coming back telling us the Aboriginal word for all the different animals, the favourite of course was the Ginga….saltwater crocodile. 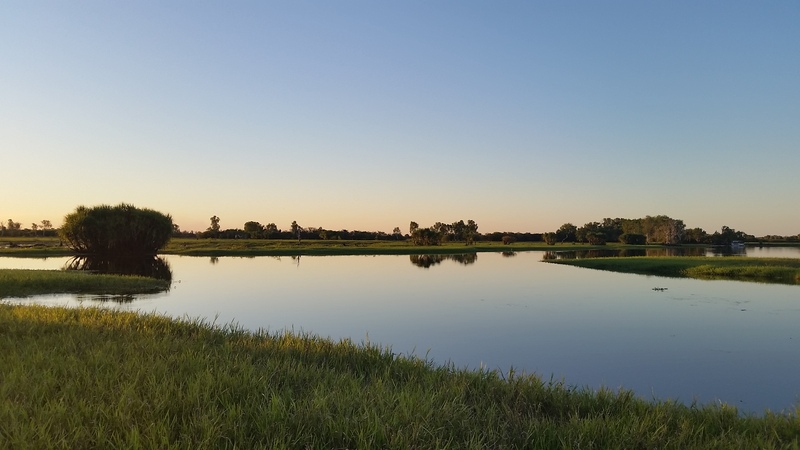 Staying at Cooinda, we were also able to watch the sunset just around the corner at the Yellow Water billabong, where we spotted countless birds and even two buffalos, who are considered feral pests of the park, in the distance. 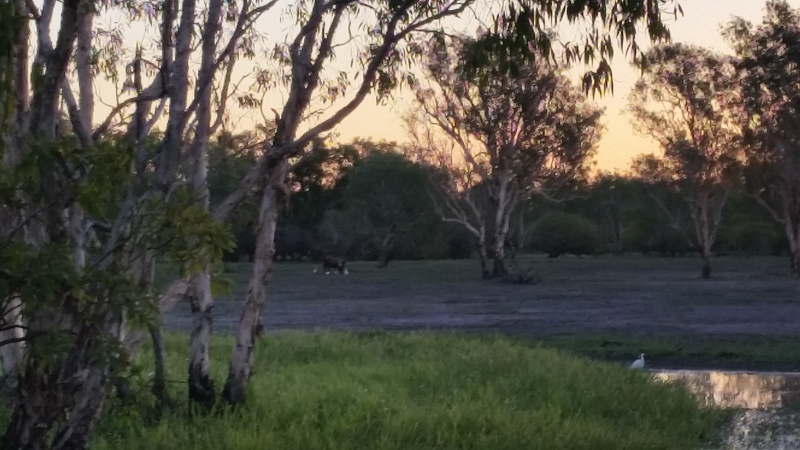 Feral buffalo in the distance at Yellow River. 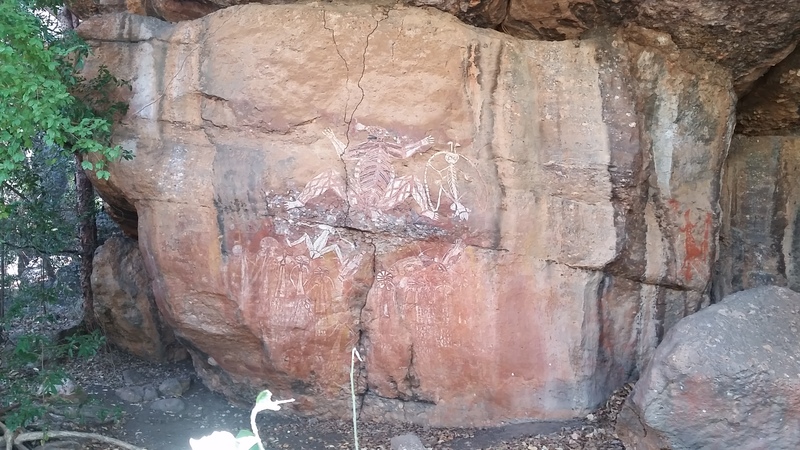 Another day out from Cooinda had us travelling a short 30km to the Nourlangie region, famous for its rock art. 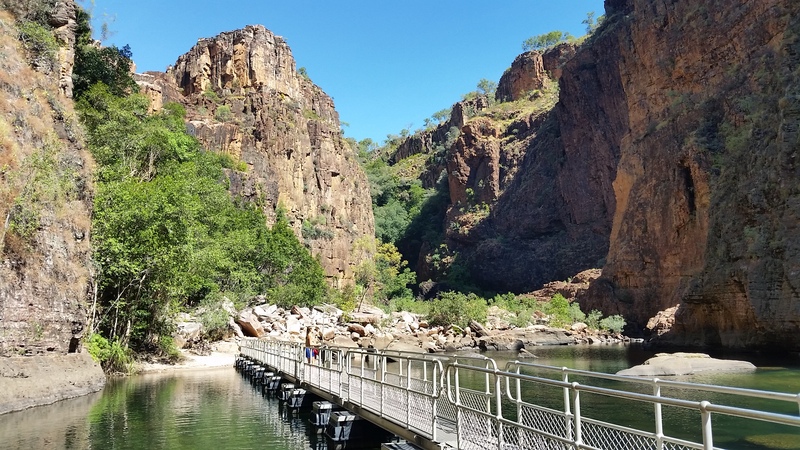 The walk at Nourlangie takes you up to Gunwarddehwardde Lookout, where you have an extensive view of the surrounding woodlands and escarpment and then back down along ancient Aboriginal shelters containing numerous amounts of rock art. We attended the ranger talk here, which was very informative and took over 2 hours, first explaining to us the use of fire management in the park, then also about the cultural significance of the surrounding rock (Burrunggui) and woodland area (Anbangbang) and the role they played as Creation Ancestors in the creation time. 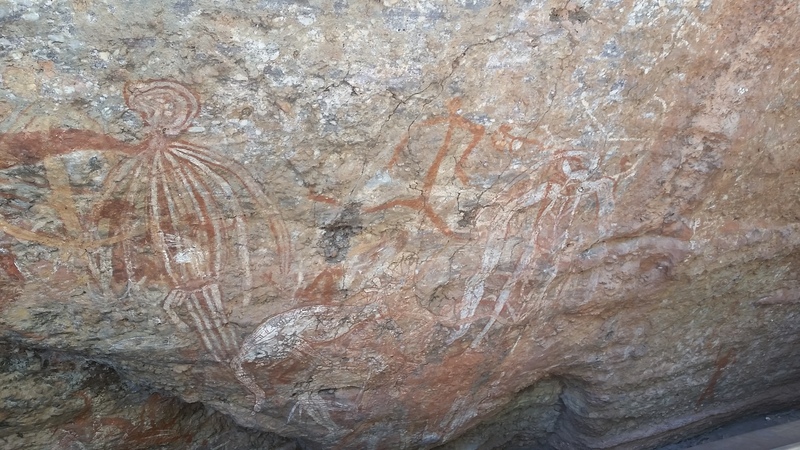 The main story the rock art told, was the story about the Namarrgon (Lightning Man), who lives there at Nourlangie. 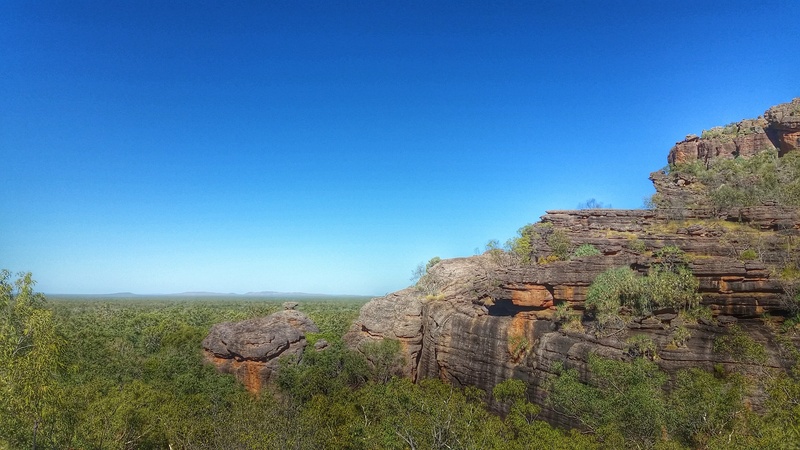 The ranger then went on to explain that during the many electrical storms over the wet season the Burrunggui rock would experience up to 100 bolts of lightning per minute, which explained why it was known as the home to Namarrgon. However, for those of us with a more scientific way of thinking, the ranger then explained that the large amounts of lightning activity were due to the large amounts of uranium present in the surrounding rock…..
Lookout from Burrunggui, home of Namarrgon. In total we spent 4 nights at Cooinda, exploring the surrounding areas and also relaxing after some very long and hot walks earlier on in the week. We were also lucky enough to catch up with our travelling friends, the Hamiltons, who we first met back on the Gibb, we had quite a bit to catch up on as they had been to Darwin, Litchfield, down to Adelaide to pick up their new caravan (their other van caught fire in Port Hedland), Alice Springs and Uluru. 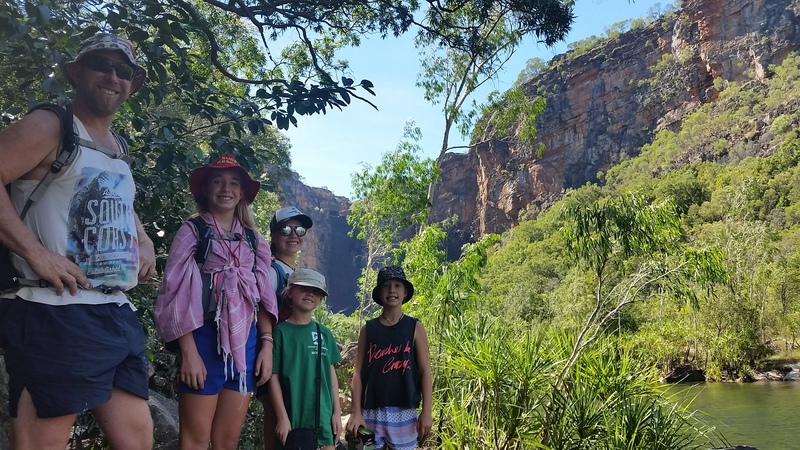 We were very happy for them with their new van, after toughing it out in the tent all the way from the Pilbara to Darwin, they deserved to get back into the swing of travelling with a little more comfort. 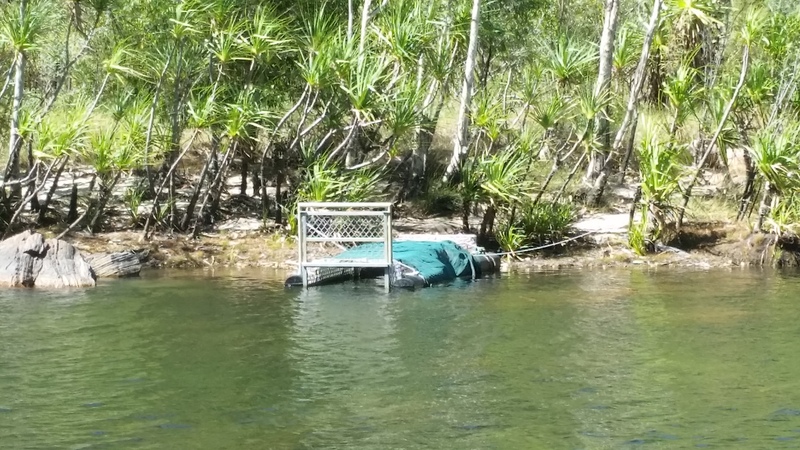 After a quick catch up they had to keep on moving eastwards towards the cape in QLD, very excited to hear how they go!!! 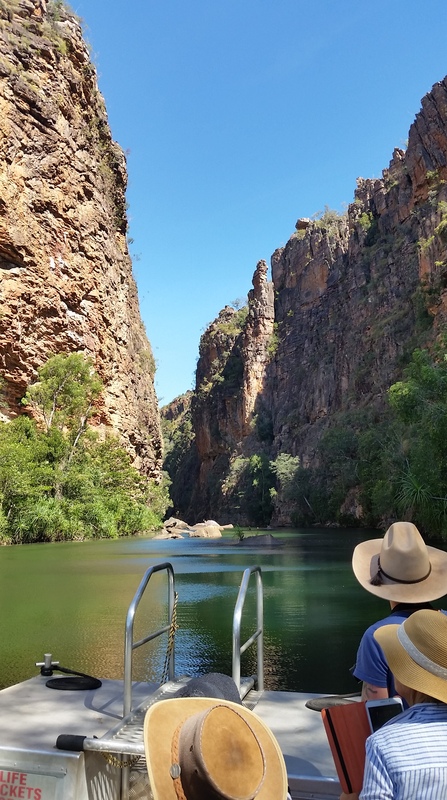 We also spent a lot of time in the pool and perhaps a bit more time in the surrounding bar area….. this heat really makes you thirsty….. however we were looking forward to moving further north towards our next adventure and destination on our OZLAP…………..